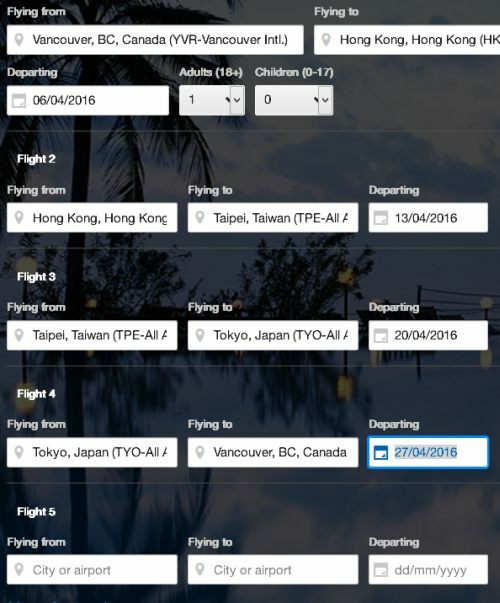 The 3 in 1 trip to Asia involves flying from Vancouver to Hong Kong, to Taiwan, to Japan, and back home, all for as low as $701 CAD roundtrip including taxes. The pricetag is around what one would typically consider a good roundtrip price from Vancouver to just one of these 3 countries on their own. With this variation, you are substituting Seoul, South Korea for Tokyo, Japan. vancouver, yvr, flight deals, air canada, taipei, taiwan, tpe, asia, east asia, tokyo, japan, hnd, nrt, cathay pacific, hong kong, hkg, seoul, south korea, icn and hong kong airlines. 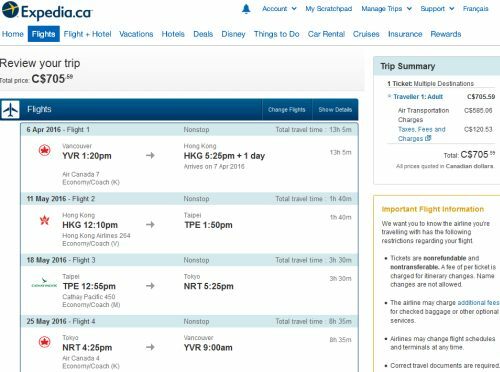 16 Responses to "3 in 1 trip to Asia | Vancouver to Hong Kong, Taiwan, AND Japan for $701 to $838 CAD roundtrip including taxes"
For shorter stay, April 13-17-21-24 = $721 Nonstop including taxes and fees. Looking for longer stay in Aug and Sept......pls comment if you find something. Thanks!!!!!!! Thanks a million Chris!! Booked End of September - End of October for my parents, it even was a nice deal connecting back home to YYC! Chris, have you been to these places? How many days would you recommend in each? I'm trying to balance wanting to see enough/not rush through the cities while also staying in budget. Planning for late May/early June. This also works for just YVR -> Taipei -> Hong Kong -> YVR for ~$585. just booked for end of March to mif April! Awsome deal! Thanks so much for the posting Chris! I have found the following as well. This works out perfect as my family are in Kaohsiung/Taiwan, and flight from KHH to YVR would always mean a layver somewhere. 5 hours of layover at Osaka gives our young family a good break before the next 10-hour flight. My kids are only missing the first week of school, which is still acceptable for elementary children. No problem, have a great trip guys! Chokri: I've been to Taipei and Tokyo, but not to Hong Kong. You can probably see most of Taipei's highlights in 2-3 nights. If you can get outside the city there are some scenic hikes not too far from Taipei. I would also recommend Taroko Gorge on the eastern side of Taiwan. There are also some nice beaches in the south. I went to Taiwan without knowing much about it, and it really surprised me. A lot more natural beauty than I expected. Delicious food. Super friendly people, often running up to help any time I looked lost. And so incredibly efficient. I don't think I saw another western tourist the entire time. Loved it. I can't find $701 deals for late Sept - late Oct anymore. perhaps all gone ? 837 is still not bad considering my husband and I went 4 years ago similar itin, $1900. That also included bangkok tho. Thank you, Chris! I did 4 days HK, 4 days Taipei, 7 days Toyko. Booked it for my family. Not $701 but still a fantastic deal! Thank you very much Chris! Chokri & Ivy: Have a great time over there!